Cellaxy is an ideal add-on to the HelioKlischograph, the global standard output device for packaging gravure cylinders. Cellaxy and the various HelioKlischograph models really make their mark in tandem whenever the focus is on high-quality results. Another option is utilizing Cellaxy for direct lasering of embossing cylinders, where it far outperforms all established milling and laser technologies in terms of quality, availability, and production speed. Cellaxy has up to two CW (continuous wave) fiber lasers with a total power of 1200 W. The CW fiber laser can produce a steady, uninterrupted laser beam and also allows users to pulse or cycle the beam. The Cellaxy laser’s screen definition and write resolution can be adjusted independently of each other. For example, text can be reproduced achieving a very high edge definition with a resolution of 2540 dpi and images in a 60 l/cm screen with soft vignettes. In addition, the geometry of the laser-engraved cell enables it to apply more ink than a cell engraved using a diamond stylus. Thanks to these two effects, a gravure form lasered using Cellaxy meets both the toughest contour definition demands and high printing density requirements. Cellaxy can be integrated seamlessly into existing digital prepress operations for HelioKlischograph systems. The same job ticket is used to configure both Cellaxy and the HelioKlischograph. Furthermore, Cellaxy requires no changes at all to the usual cylinder surface requirements for the copper process. The optional embossing module gives Cellaxy all the features it needs to produce impressive embossing forms. A machine equipped for embossing performs fully automated multipass engraving with an engraving depth of up to 1000 µm. 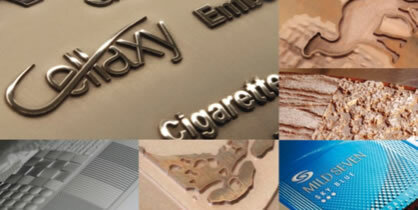 Both 2D and 3D embossing forms are produced in the highest possible quality. The print results achieved with Cellaxy embossing processes are highly impressive thanks to long-lasting tactile qualities and optimum attention to detail. This applies equally to micro-embossing over large areas and background textures. Cellaxy for embossing far outperforms all established milling and laser technologies in terms of quality, availability, and production speed.